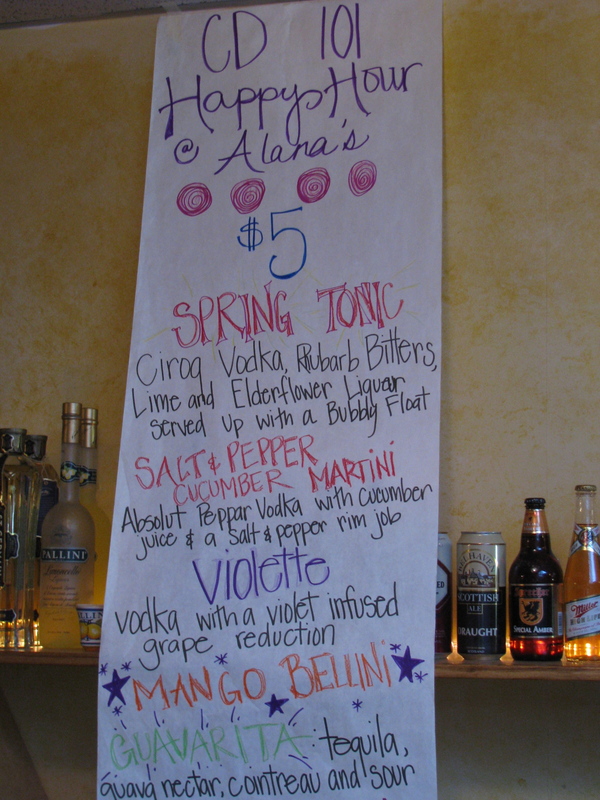 If you ever have the chance to go to Alana’s for a happy hour, you should go. Alana’s has one of the best cocktail menu’s in town: creative and seasonal, just what you would expect from Alana. This one was a CD101 happy hour, part of a partnership with Dine Originals and each month they host a happy hour in a different Dine Originals restaurant. 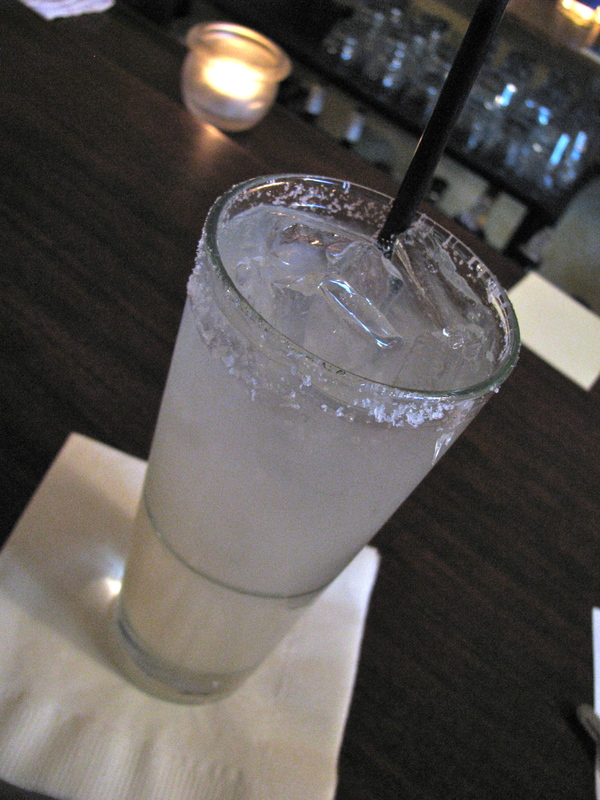 I tried the guavarita which was an easy to drink mix of not-too-sweet, salty and fruity with tequila as the dominant flavor; but my favorite was the spring tonic. I’m a sucker for champagne cocktails and this one is wonderful. Floral elderflower with its sweetness cut by the aromatic bitters, perfect. There were about eight different appetizers served over the course of the evening, a couple of which I have had as amuses at the restaurant before. We kept being enticed back to see what new dish had arrived and because we couldn’t resist just one more taste. They included beef wrapped around a creamy beet slaw, Asian fish balls with mango coulis, tiny rice cakes with wasabi tobiko (flying fish roe), crackers with pate, deep fried balls of daikon radish, feta and sun-dried tomato tapenade on pita, chocolate brownies with black walnuts and brie with focaccia. 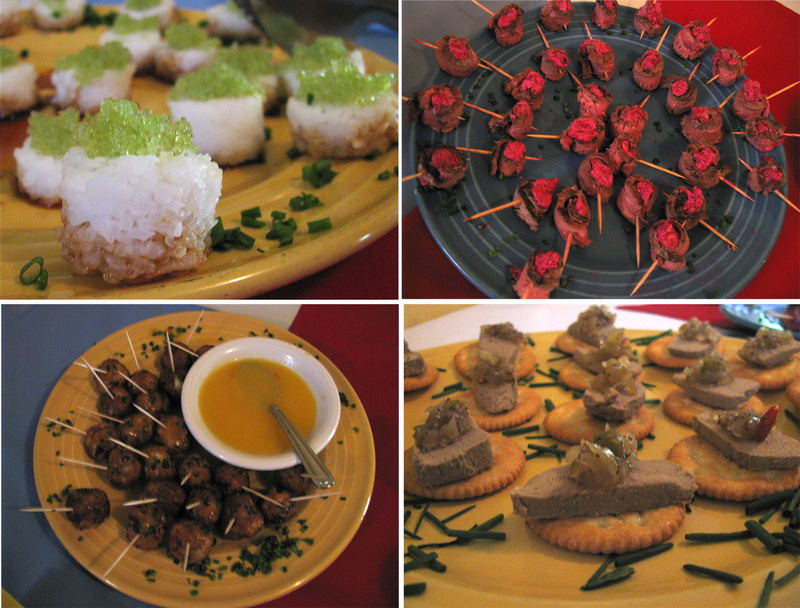 My favorite was probably the pate – a creamy liver pate (braunschweiger?) topped on unpretentious ritz crackers with an aromatic Indian chutney. It was a beautiful evening and long after happy hour ended we were sitting on the patio chatting with friends and drinking wine. We had planned to relocate, but it was hard to think of anywhere better that one could be. 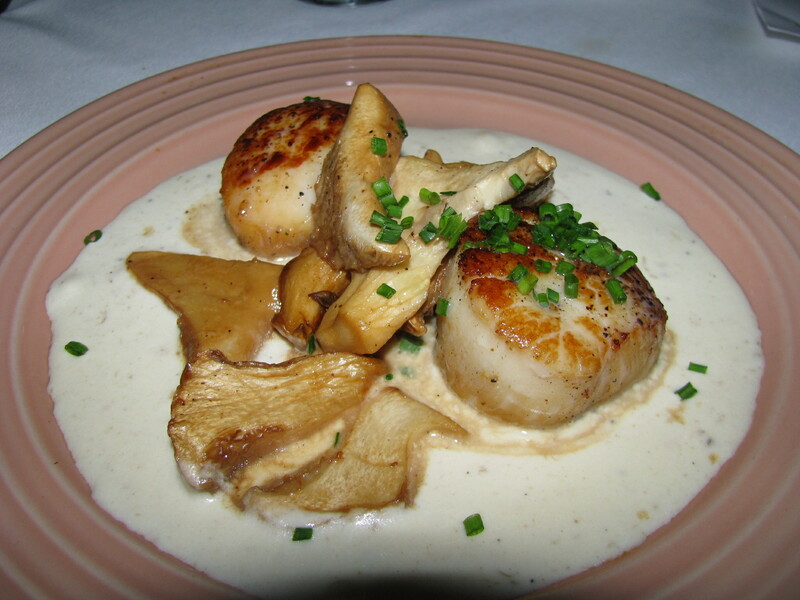 Eventually we were unable to resist more food and we shared Moroccan spiced lamb in a zucchini crespelle; scallops with sauteed mushrooms in a decadently truffled porcini cream sauce. If only all Thursday evenings could end like this. If you haven’t been to Alana’s sitting at the bar with an appetizer (or two) and a cocktail or a glass of wine is a great introduction. Alana’s serve all their wines at retail prices which is a rare and wonderful thing. 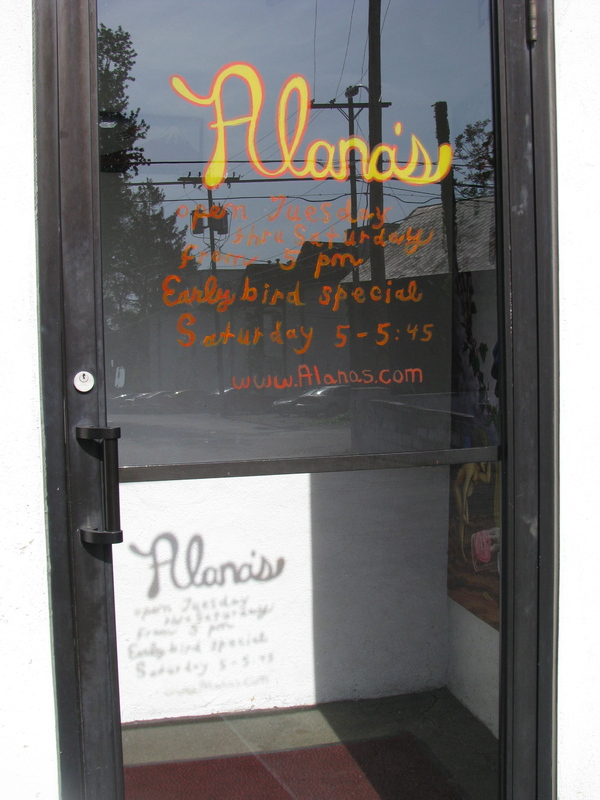 The early bird special is another great way to try Alana’s. On Saturdays at 5pm you can have a 3 course dinner for $25. 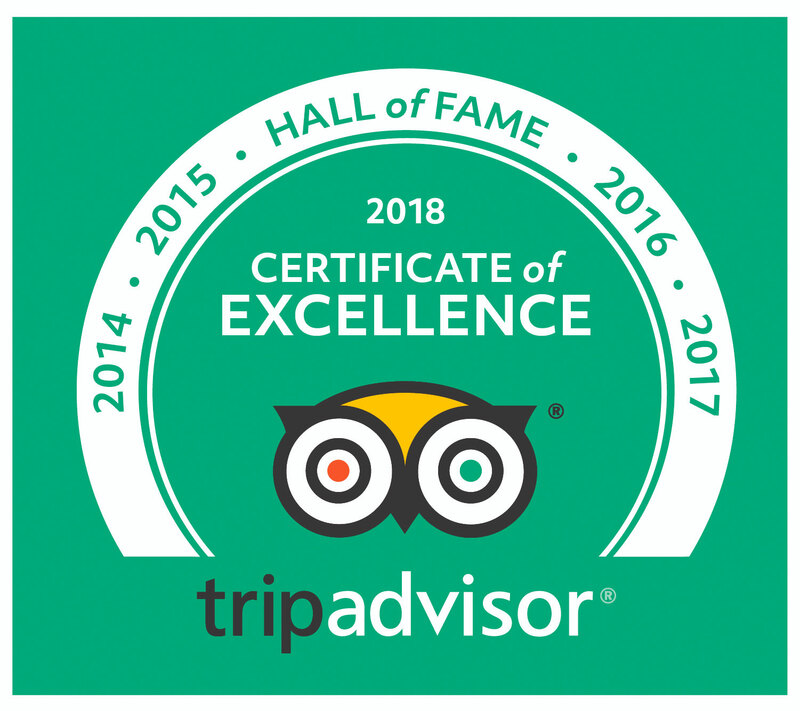 We did this last summer and had a very pleasant dinner on the patio. Here are some more CD101 photos from the event. Could you explain what the “bubbly float” in the Spring Tonic was? Thanks! By bubbly float, they mean that it is topped off with some sparkling wine. I’m not sure exactly what they used in this instance, but it’s bubbly in the sense of champagne. Well captured. A really special place… I’m dumbstruck when people tell me they’ve never been there.